Overview Croup, also known as largnotracheobronchitis, is a usually self limiting upper airway viral infection causing upper airway obstruction. Croup is more common in boys than in girls, usually occurs between six and 36 months of age, and peaks during the second year of life. Croup is usually caused by viruses, which are detected in up to 80 percent of patients (parainfluenza the most common). Croup: a viral infection which causes swelling of the voice box (larynx) and windpipe (trachea). Typically, viral croup develops over days with a upper respiratory tract infection, with low-grade fever and coryza followed by a barking cough and various degrees of respiratory distress. In most children, the symptoms subside quickly with resolution of the cough within two days. 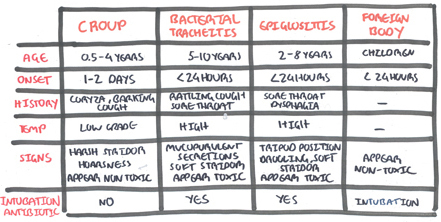 Think Children with croup should have minimal examination. Do not examine throat. Do not upset child further. Remember Children six to 36 months of age who present with abrupt onset of barking cough, hoarseness, and inspiratory stridor likely have croup. Three factors to consider when deciding whether the presence of stridor and respiratory accessory muscle use relate to croup or another disease. A single dose of dexamethasone is recommended in all patients with croup, including those with mild disease. Nebulized epinephrine is an accepted treatment in patients with moderate to severe croup. Conversely, spasmodic croup is said to be more in atopic, older children. Spasmodic croup comes on rapidly overnight in children who were perfectly well when they went to sleep. 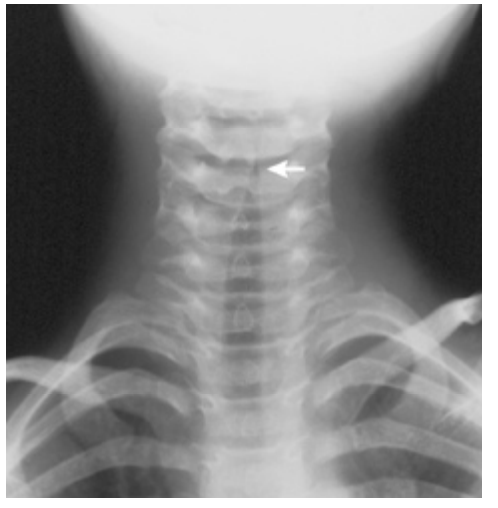 Spasmodic croup often runs a shorter course. Zoorob, R, Sidani, M, Murray, J 2011, Croup: An Overview, American family Physician, vol. 83, no. 9, pp 1067-73.